Dodge pulled the wraps off of the 2019 Durango today and while there is no huge news for the new model year, there are a handful of changes that should draw in more buyers in the coming months – the best of which is the available 19-speak Harman Kardon sound system. 2018 was a big year for the Dodge Durango as, at long last, it finally got the SRT package that Mopar fans had been calling for over the past decade or so. Unfortunately, there is nothing that exciting for the 2019 Durango, but Dodge has introduced some improvements for the new model year that will resonate well with potential customers. First and foremost, the 19-speaker Harman Kardon sound system similar to the one in the 2019 Ram 1500 is now available in the Durango in Citadel, R/T and SRT trim. Previously, the premium sound system in the Durango was the Beats system and while that is a solid setup, it falls well short of the HK system in the new Ram. The Hellcat Challenger and Charger have a similar, 18-speaker Harman Kardon system that is pretty fantastic, so potential Durango owners should be excited at the prospect of getting the HK system rather than Beats. Next, all 2019 Dodge Durango models have an available integrated trailer brake that comes as part of the Trailer Tow package. This will be a great feature for those Durango owners who are looking to exercise the 8,700-pound towing capacity, as an integrated trailer brake makes stopping easier while also causing less wear on the vehicle’s brakes. 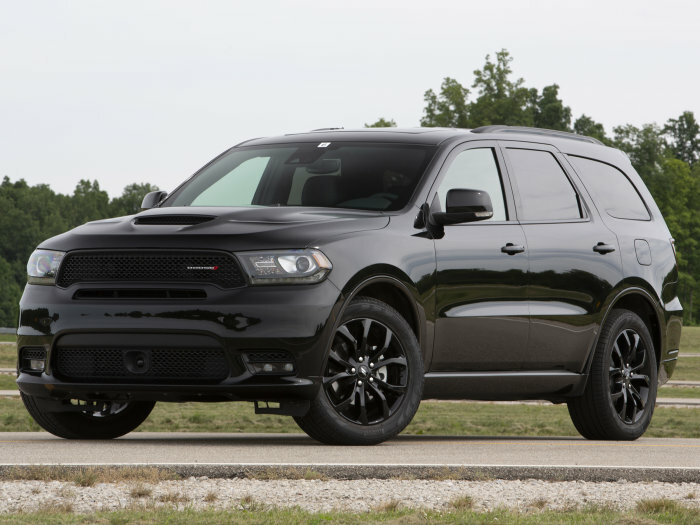 For the 2018 model year, the aggressive SRT front fascia was also available on the R/T models, but for 2019, that sporty look is applied to the Durango GT as well (shown above in black). This means that the front end look of the Durango SRT is shared with the GT and R/T models, while the SRT hood is standard on the SRT models and optional on the GT and R/T. The 2019 Durango SXT and Citadel continue ton with the non-SRT front end, for those who don’t like the aggressive design of the SRT. That being said, I think that the SRT front end is the best looking of the group, so it makes sense for Dodge to try to spur sales a bit by introducing more models with the sporty face. In addition to the changes listed above, there are a variety of new options and features within each trimline, which we have detailed below. SRT – The 2019 Durango SRT is now available with red seat belts, high performance Brembo brakes with two-piece rotors and the 20-inch wheels can be painted Matte Vapor (dark silver) or Brass Monkey (dark bronze). R/T – The 2019 Durango R/T gets a new 20-inch wheel design available in Satin Carbon or Brass Money along with optional Sepia leather seats. Citadel – In addition to the new optional speaker system, the Durango Citadel now comes with standard second-row captains chairs. GT – Like the R/T, the GT package comes with new 20-inch wheels in Satin Carbon or Brass Money, along with a new cloth seating option for those who don’t like leather. SXT – Finally, the Durango SXT can now be ordered with leather seats. The 2019 Dodge Durango will be offered in a total of 11 colors, 8 of which will be available as soon as these models go on sale. This includes - In-Violet, Octane Red, Redline Red, Granite, Billet, DB Black, White Knuckle and Vice White. There are three new colors coming later in the model year, including Reactor Blue, Destroyer Gray and F8 Green.